Jewish Federation of Cleveland: Kosher Nutritious: Ready for Passover! Kosher Nutritious: Ready for Passover! I had the pleasure of spending my junior year of college at Hebrew University in Jerusalem. One of the perks of that year was meeting and growing close with my cousin Ziva, who happened to work at Hadassah Hospital across the street from my dorm. We spent a lot of time together and she invited me to spend many Shabbatot and holidays with her family. In addition to being hilariously funny, warm and nurturing, Ziva had another talent, as well: She was, and remains, an amazing cook. 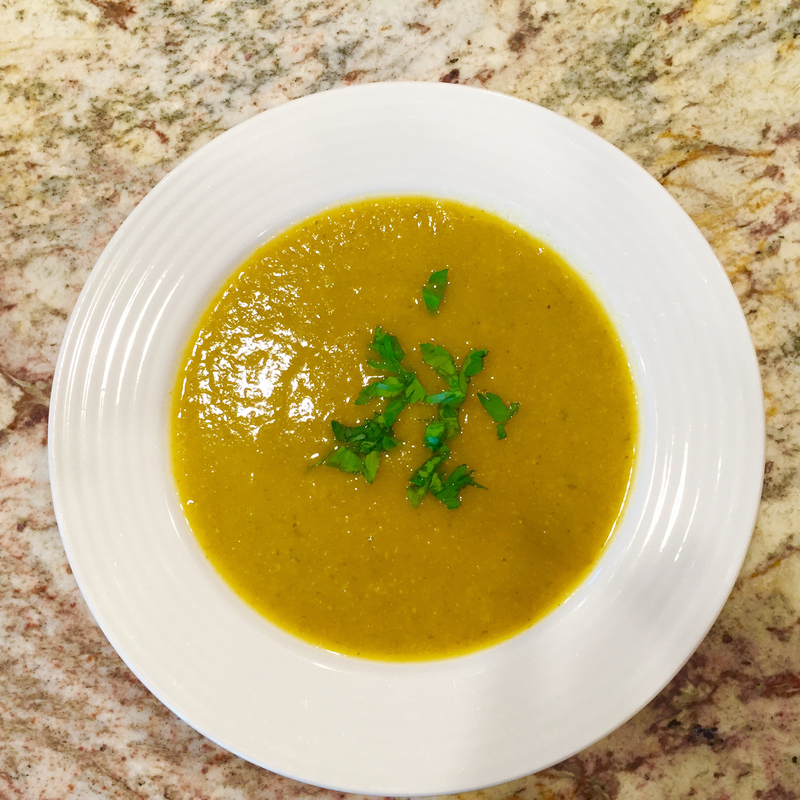 I am excited to share one of her recipes with you below, which I hope will make your preparations for Passover a bit easier. Passover begins this year at sundown on Friday, April 22. The name Passover commemorates the miracle of G-d passing over the Jewish homes in ancient Egypt and visiting the Plague of the Firstborn only on the Egyptians. This plague ultimately forced Pharoah’s hand and persuaded him to give the Children of Israel their freedom after 400 years of slavery. But the Passover holiday has 3 other names, as well. The first is the Holiday of Matzot, to remember that we left Egypt so hastily that we did not have time to allow our bread to rise and instead ate matzah as we fled Egypt. The second is the Holiday of Springtime because our Exodus from Egypt took place in the Spring. I am hopeful that since Passover is so late this year, my fellow Clevelanders will actually celebrate Passover in spring weather! The third is the Festival of Freedom in which we acknowledge that our deliverance from Egyptian servitude is what enabled us to assume our national and religious identity as Jews. On a practical level, I want to free you, dear reader, from hours of slaving in the kitchen with these quick and healthy recipes, so you have more time this holiday to spend with family and friends. Wishing you all a wonderful, healthy, nutritious Passover. Heat oil in a soup pot and add leeks. Saute until they are soft and shiny. Add cauliflower, parsley, stock, salt and pepper. Bring to a boil and then lower heat to simmer. Cook for about 30 minutes until cauliflower is soft. Blend with an immersion blender, adding liquid ¼ at a time if needed, to thin soup to desired consistency. Adjust seasoning if needed and continue simmering for another hour. 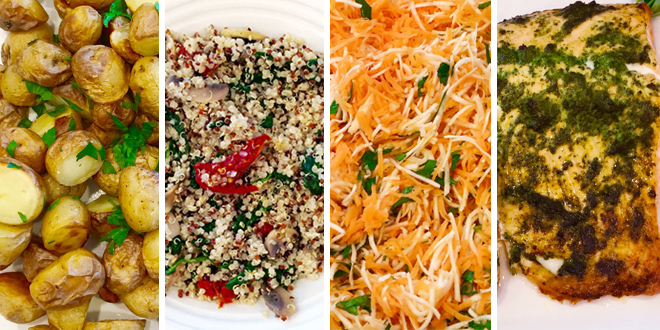 Garnish with chopped parsley when serving. Line a baking sheet with foil and place fish grill basket, if you have one, on baking sheet. (See photo.) If you don’t have a fish grill basket, you can simply bake the fish on the foil lined baking sheet. I like the basket because it enables a lot of the oil from the fish to drip onto the cookie sheet. Feel free to improvise with other equipment in your kitchen that will keep the fish elevated over the baking sheet to allow the oil to drip down. For instance, I have used an inverted pizza pan with holes placed over a cookie sheet, and that does the trick beautifully. Place the salmon on top of the grill basket. Place remaining ingredients in a small blender and blend until smooth. Taste and add a pinch more salt, if needed. Use a basting brush or the back of a spoon to spread the mixture on the fish. Place in oven and bake for 25 minutes or to desired level of doneness. 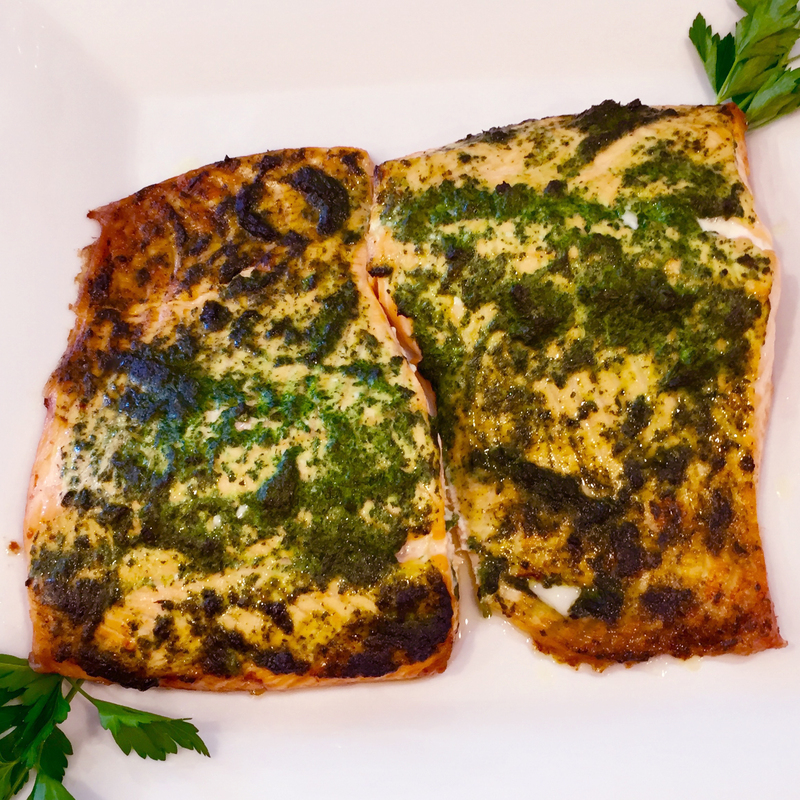 If needed, broil fish for 3-4 minutes to brown the top a bit. Allow the fish to rest at room temperature for a few minutes before serving so it can firm up. Rinse quinoa in a mesh sieve and place in pot. Add water and bring to a boil. Lower heat, cover pot and continue cooking for 14 minutes, or until all water is absorbed. Heat oil in a pan. Add mushrooms, salt and pepper and sauté until mushrooms are soft and shiny. Add spinach and continue to sauté, until spinach is completely wilted and water has evaporated. 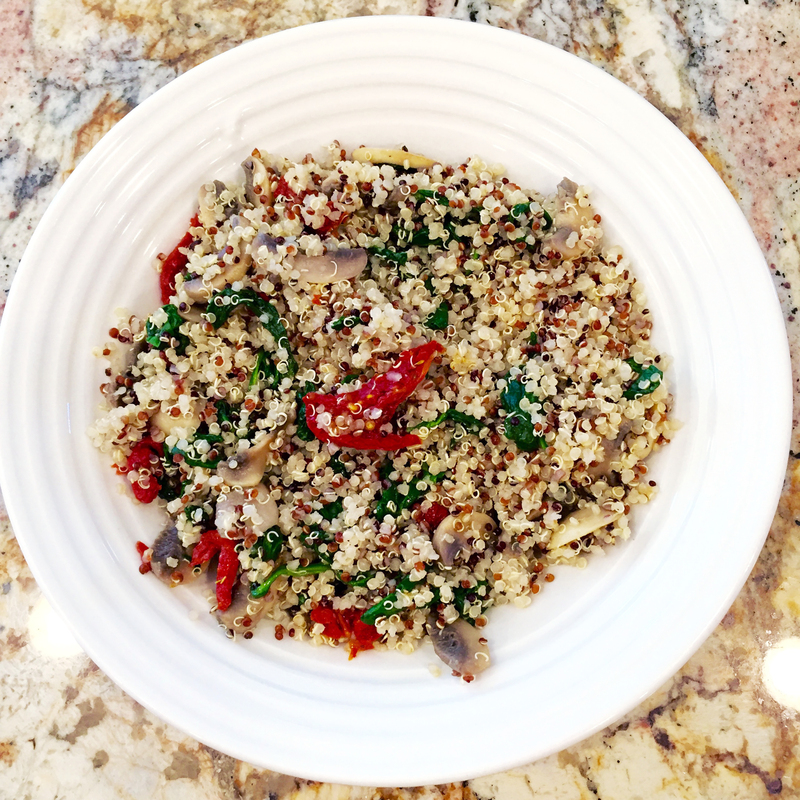 Place quinoa in a serving bowl and add spinach and mushroom mixture. Add sun dried tomatoes and mix well. Line a cookie sheet with foil and place tomato halves on it. Place in a 200 degree oven for several hours or until desired texture is reached. Place potatoes in a bowl and add remaining ingredients. 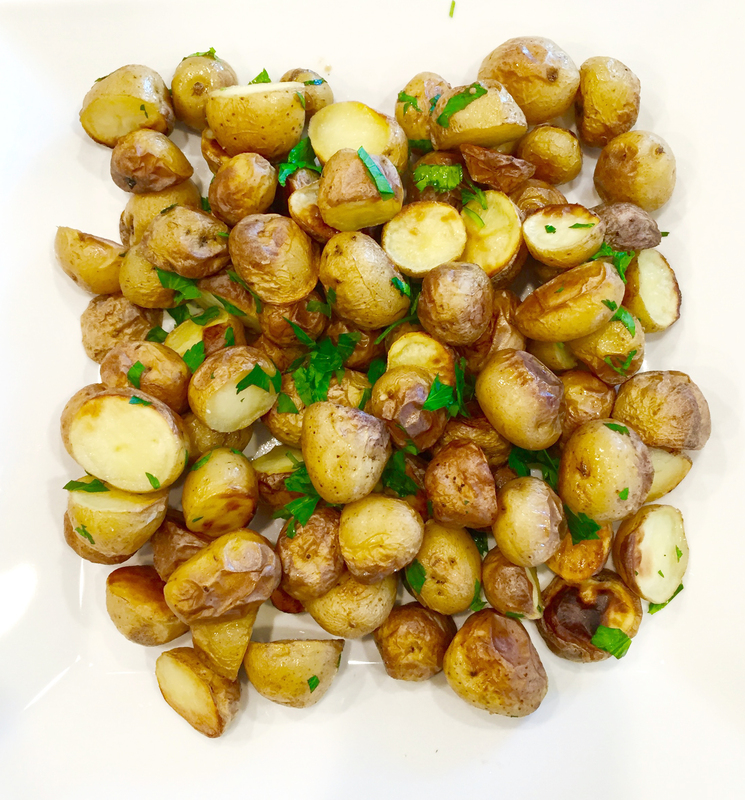 Pour onto a foil lined baking sheet and spread potatoes so they are in a single layer. Bake for 25 minutes, or until potatoes are completely soft and begin to brown. Remove from oven and allow to cool for a few minutes. 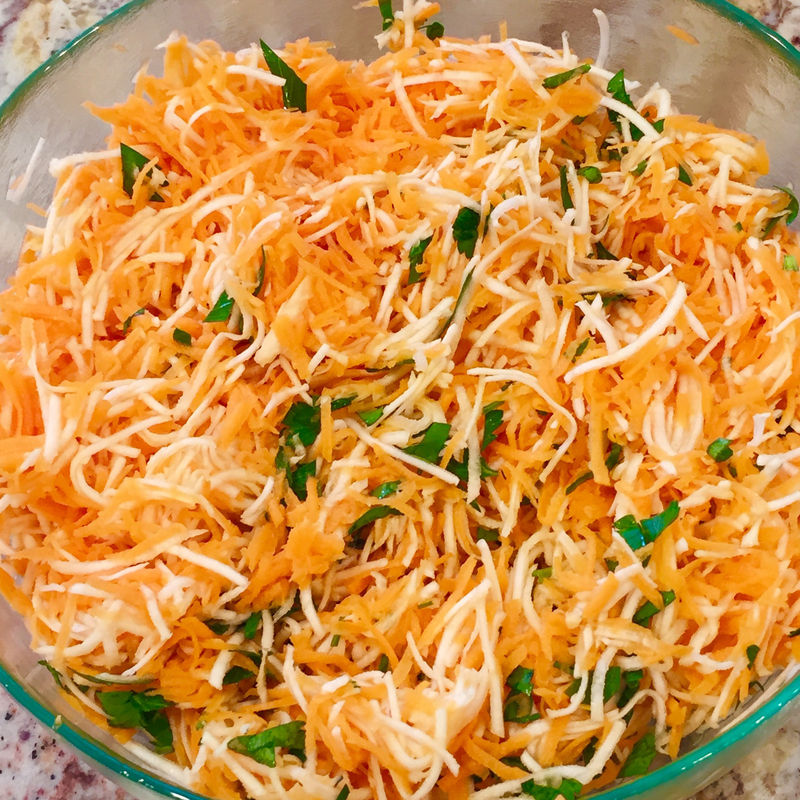 Using the shredding attachment of a food processor, shred carrots and celery root chunks. Place in a serving bowl and add remaining ingredients. Mix well and adjust salt if necessary. Let sit for ½ hour or more before serving so flavors meld. Whether the motivation is weight management, athletic performance or disease management, clinical nutritionist Caroline Sharvit helps clients incorporate their food preferences within the framework of a healthy food plan and promotes long term strategies aimed at achieving weight and wellness goals. Caroline holds a Master’s Degree in Clinical Nutrition from New York University, and is a Registered Dietitian Nutritionist and a member of the Academy of Nutrition and Dietetics. She provides nutrition counseling for children and adults through Tree of Knowledge, an educational services provider in Cleveland, Ohio.